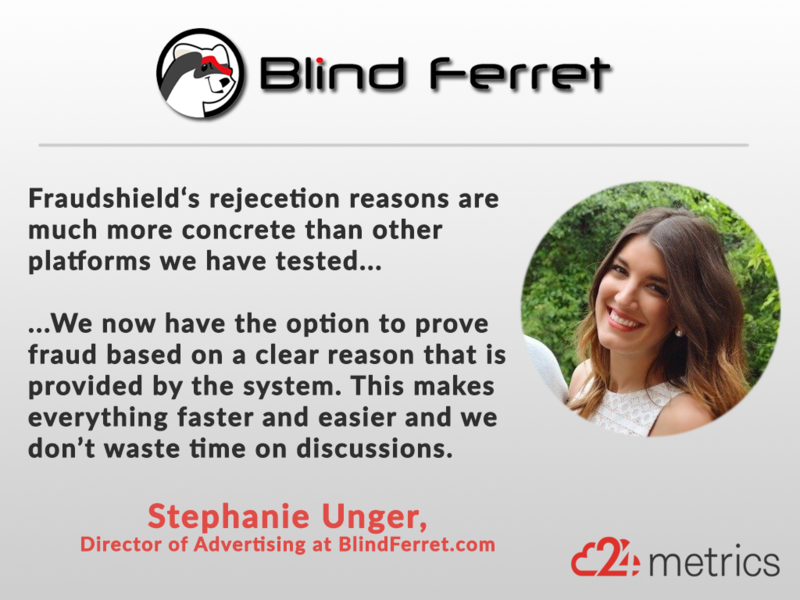 This week, we met up with Stephanie Unger, Director of Advertising of Blindferret.com. We were curious to see what insights Stephanie could share with our readers. We all know that fraud in the online advertising is evolving quickly. In order to be ahead of the fraudsters you need to understand what they are doing, how they are thinking and how you can stop them. 1. Tell me a bit about yourself, your role at Blind Ferret and about the responsibilities of your team? Hi, my name is Stephanie Unger and I am the Director of Advertising of Blind Ferret. I oversee the Operations Department and my duties include Campaign Management, Campaign Set Up’s, Tracking & Attribution issues, Fraud Detection as well as the Publisher Department. 2. What type of advertising campaigns are you running at Blind Ferret? CPI, CPA, CPL, CPM? We are mostling running Cost Per Install campaigns (CPI). 3. Regarding your experience, do you think that Ad Fraud is a big problem in the online advertising industry? If yes, do you have any insights? Yes, fraud is a major issue on the performance side of the industry and it seems when we rid ourselves of one type of Fraud, another one pops up. Fraudsters are getting better at masking the fraud and at faking KPIs. For example, we will see users reach very high retention rates, but never actually play the game or generate any sort of LTV for the client. 4. How long have you been using FraudShield and why did you decide to give it a try? We’ve been using FraudShield for about 7 months, and we decided to use it because clients were coming back to us on fraud with very little proof. It was difficult to reverse installs with our publishers without proper reporting and reasoning. It was also impossible to prevent. Now with FraudShield we have the option to proof them based on a clear reason that is provided by the system. This makes everything faster and easier and we don’t waste time on discussions. 5. What makes FraudShield different compared to other similar services? Fraudshields interface is very easy to use, and the reason codes are much more concrete than other platforms we have tested. 6. How does FraudShield help you and your team in your business on a daily basis? We are now able to act proactively when it comes to catching fraudsters, which has been helpful in saving headaches and money at the end of the month when a client comes back to us. We are also often able to justify reversals that are KPI based. For example: If a client refuses to pay for traffic with less than a 10% retention rate, but the publishers refuse to reverse on retention alone, we can use FraudShield to find indications of fraud. Generally clean traffic will not have such a low retention rate so we almost always find fraud in these instances. Fraudshield reports help us build a stronger case for reversals. 7. What types of Fraud have you experienced the most in the last 12 months? We have experienced a lot of Click fraud, Bot traffic, Blended Incentivized Traffic, Emulators and much more. Advertising Fraud is a complex problem and getting more serious problem every day. If you delay to take action, you will regret it in the long run. 8. What are your top 3 tips to stop Ad Fraud in your business? 1. Be proactive, blacklist bad publishers from your network. 2. Try not to share too much info with the fraudsters or they will just figure out new ways to mask the fraud. 3. Look for abnormal patterns, even if retention looks good, are the users playing the game? Are they making purchases? Are the OS versions what you would expect to see based on market trends? 9. Anything you would like to add? We have tried other Fraud Detection Services out there, but have found FraudShield to be the best for us. Having a transparent rejection reason for every single conversion is really helpful for our business.